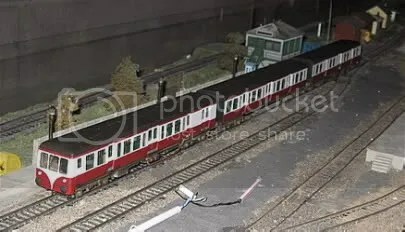 It is evident from discussion that there are a number of modellers who want to progress to brass and nickel silver kits, but are loathe to make the jump because there seems to be nothing for the ‘beginner’ to try their soldering skills with first. I was at this stage once and still find soldering outside my ‘comfort zone’, but am becoming more skilled and increasingly confident, though I don’t profess to be an expert. The Tralee & Dingle three-plank wagon, available from Worsley Works is, I believe, a good starting point. 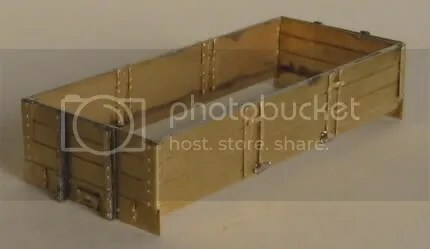 It is low cost (£4.50 + £1.50 P&P), can be used for either 009 or 00n3, and if you bottle out can be stuck together with glue (I have built a wagon using epoxy resin). It is designed to fit the Parkside Dundas Tralee & Dingle van chassis. 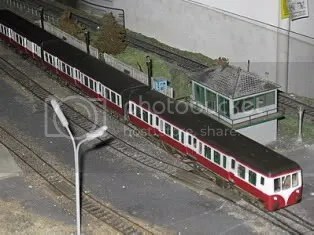 I am attempting to build Annascaul Station on the Tralee & Dingle Light Railway and whilst there is a lot of stock available from model manufacturers several key items are not catered for, the three-plank wagon being one of them. With the help of published and unpublished photographs (generously loaned by David Rowlands) I drew diagrams for the wagon and sent them to Allen Doherty at Worsley Works, who used them to create the necessary brass etches for the kit. The best published photograph of a three plank wagon (and one I relied upon heavily in the diagrams) can be found in The Tralee & Dingle Railway by David Rowlands, published by Bradford Barton, p75. By the time of closure each of the remaining wagons had been reconstructed so there were differences between them. Photo #1: This shows the etch, constructed wagon body and the completed wagon on Parkside Dundas T&D van chassis. Photo #2: The set up used for soldering. An Antex 25W soldering iron and stand, flux and 145° solder. I do not usually go to the extreme of soldering outside, but on a nice day it's quite pleasant, but don't drop any parts! Photo#3: The first job is to tap in the bolt heads. I do this with a pin whilst the brass etch is resting on a piece of hardboard. A light tap is enough. When this is done flux and solder (tin) the insides of both sides and ends. When completed cut the parts out of the fret and clean up the rough edges with a file. Photo #4: Line up the pieces, ensuring that the outside overlaps the inside section equally at both ends. 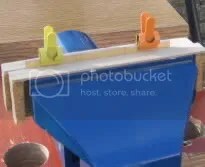 I have recently acquired some little clips to help. The work is then held in a vice. Photo #5: Flux is applied to the top edge and then solder run along the joint. Photo #6: When happy with the join put the side or end on the work surface, inner side up and then apply heat from the soldering iron to help the tinned sides make a better bond. There should be a little solder on the tip of the iron to help with the transfer of heat. Photo #7: To join a side end place upside down on the work surface. 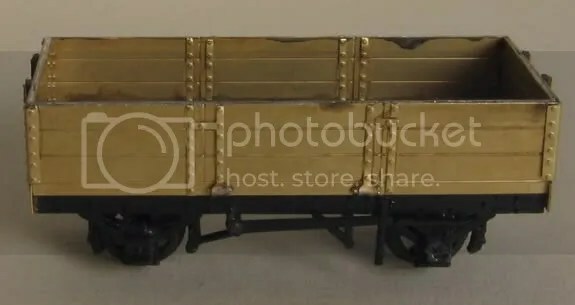 The end piece goes inside the wagon side. Make sure the joint is fluxed. I hold the work in place with Blu-tack®. I also used some fine graph paper to help get the pieces square. 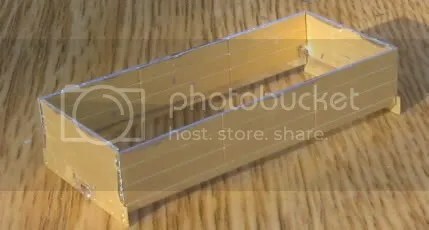 The join between the two parts can then be soldered. Photo #8: When both pairs of sides and ends have been joined I then solder up the remaining corners an the basic body shell is complete. You may wish to trial fit the chassis floor at this stage (see photo #11). Photo #9: The strapping can then be applied. These pieces can be easily fixed using epoxy resin. 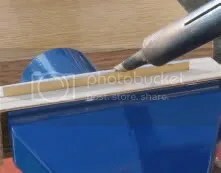 If you attempt to solder the straps make sure they are tinned on the fret first, and would be an idea to apply the straps to the work before the sides are built up. 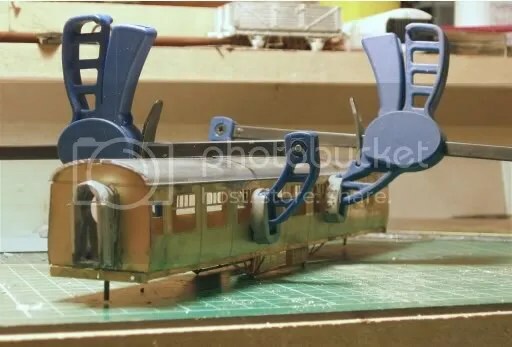 The tall end straps are raised from the body and I glued these to strips of plastic card, and then these in turn were glued to the wagon ends. Photo #10: The corner plates need careful bending in a vice. I held them between two rulers and pressed the edge over with a small piece of 1" x 1" timber. 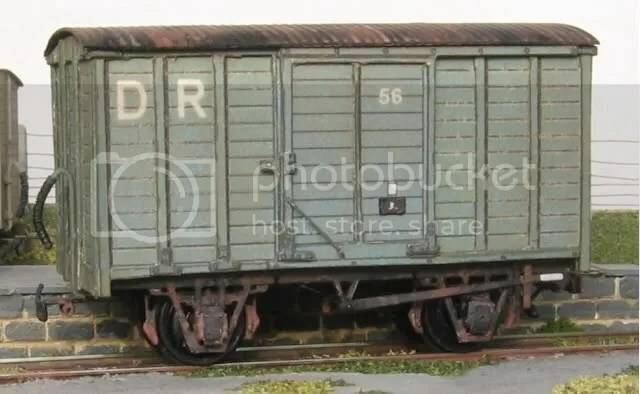 On the actual wagon the short edge went along the side so there is no need to panic if the two edges are not the same length. To complete the door straps lengthen the hinge gap by cutting into the etch. 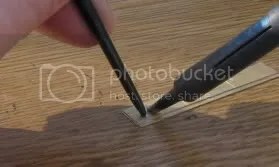 Place a fine piece of wire (not supplied) on the edge of the board (with Sellotape®) and press to shape. If the wire has been tinned and the job fluxed this is an easy soldering job. Cut off spare wire and etch before fixing in place. The door straps should just overlap the edges for the door sides. Photo #11: The Parkside Dundas chassis can be made up. 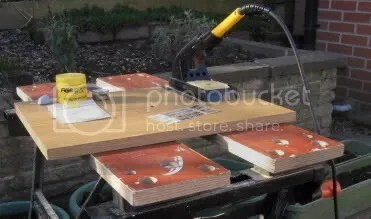 The floor needs to be carefully sanded to size, a tad off each end (including the sole bars) and a little more off the sides (circa 0.25mm each side) so that the body fits the floor (it might be an idea to fit this before the strapping is applied as a 'dry run'). Don't get too carried away as it is easy to remove too much floor. Next the body is glued to the floor. Vacuum pipes need to be sourced (or those that come with the chassis can be used) plus couplings of choice added to complete construction. It is best to give the brass a coat of etched brass primer before painting and weathering to taste. Hopefully, you have now completed a first successful taste of soldered kit construction. Do remember that if you bottle out with the soldering then the kit can be glued together, so it won't be wasted. Thanks to David Rowlands for the loan of photographs, Allen Doherty for the preparation of etches and Simon Starr for exchange of ideas. 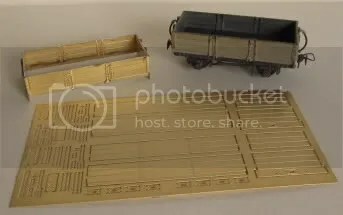 If anyone has already purchased one (or more) of the three-plank wagon kits there was an error with the original production etch. The right hand door straps are now available on receipt of an SAE from Worsley Works. 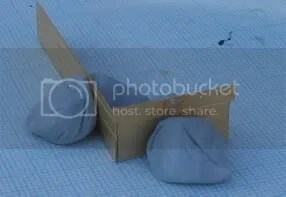 My third wagon was completed with these.